The Vancouver Condo Buzz » BRAND NEW Richmond AVANTI Apartments by Polygon near Canada SkyTrain Line, Shopping/Dining & Entertainment! « Lower Lonsdale WALLACE & MCDOWELL North Vancouver Condos for Sale near Waterfront & Lonsdale Quay/Seabus! Built Green Gold Standards and North Shore View Residences for Sale! BRAND NEW Richmond AVANTI Apartments by Polygon near Canada SkyTrain Line, Shopping/Dining & Entertainment! Please note that you can visit the Polygon Homes web site for more details as they are released! The reason for our blog post about the preconstruction Richmond AVANTI Apartments is to inform our readers about this new and exciting project by one of the top local builders (and our favourite). Located just steps from Aberdeen Centre shopping and dining, the Polygon AVANTI Richmond apartment project is a landmark condominium project that will redefine urban living. These stylish and modern apartments will be located close to Richmond’s world renowned shopping and entertainment core as well as a beautiful urban park just steps away. The new Richmond AVANTI by Polygon condos will have a truly unique design and architecture, mimicking the city’s first ‘flatiron architecture’. This iconic design by IBI Group (award winning architects) will surely stand out in a city full of modern mid-rise glass towers. As mentioned, the residences will border along an amenity packed urban green space and park that will be great for year round relaxation, recreation and entertaining. Here at the park, AVANTI Richmond apartment owners will find an impressive water feature and an incredible plaza for arts and cultural events celebrations (like an amphitheatre). Dan Corson Designer, an acclaimed and world renowned visual artist) also contributes beautiful and interactive light installations to the urban park. It’s just the perfect place to call home. All new Polygon AVANTI Richmond apartments have the standard yet comprehensive Home Warranty of 2-5-10 years. For more information, please refer to www.polyhomes.com today! You can also register on this blog page and we will send you information as soon as they are available for the grand opening presales launch! The name ‘AVANTI’ is actually Italian for ‘forward’ or ‘ahead’. The forward thinking vision of the beautiful new Richmond AVANTI apartments is what makes this the most exciting project in the community this year! The offering at the preconstruction Richmond AVANTI by Polygon apartments will include floor plans between 1 and 2 bedroom layouts. Inside details are scarce, but we know that the new apartments will have air conditioned interiors and contemporary design details. The living spaces will have plenty of space and modern finishes and features. The kitchens will by the Polygon high-end variety with stainless steel appliances and granite or quartz stone counters. As well, the living spaces are expected to have laminate wood floors with carpets in the bedrooms. The bathrooms/ensuites will have beautiful deep soaker tubs and walk in glass enclosed showers depending on the number of bathrooms and the floor plan that you choose. 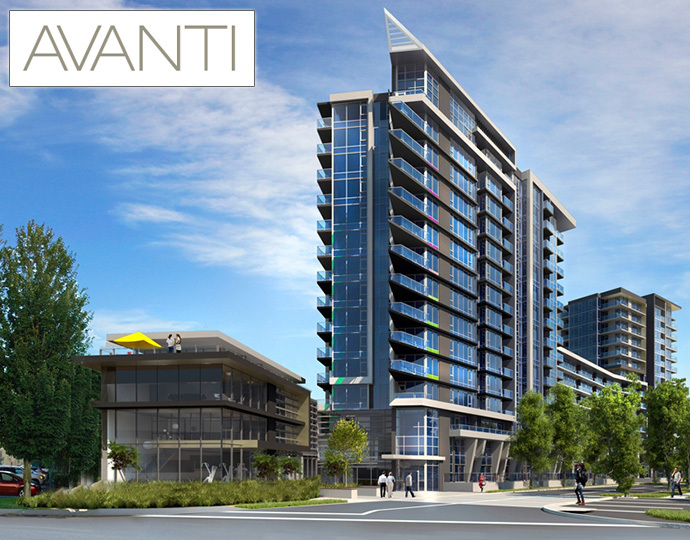 AVANTI by Polygon is centrally located in one of the most multi-cultural and diverse communities in the Lower Mainland. Situated in the heart of Central Richmond BC, the AVANTI by Polygon condos will be just steps away from the Canada SkyTrain Line that will take you to the airport (YVR), other points in Richmond as well as all the way to Waterfront Station in downtown Vancouver. As well, home owners will be just minutes away from top boutiques, big box retailers, shopping centres, restaurants, cafes and local services like banks, schools and grocery stores. It’s in one of the most walkable and pedestrian friendly neighbourhoods in the city. Just 20 minutes away from downtown Vancouver and only five minutes from YVR, this is definitely one of the most central developments in Greater Vancouver. With the continuing development of Richmond’s downtown core, the transformation is just incredible. According to the AVANTI Richmond condo web site: “Savvy homebuyers are attracted to the convenient of a location that offers an international selection of shopping, dining and services, while families appreciate the range of top quality educational alternatives, from elementary and secondary schools to post-secondary options.” There are six major shopping centres nearby, ninety parks in Richmond BC as well as Steveston Village. When it comes to on-site amenities, this project offers the AVANTI Club which is a Googleplex-inspired recharging clubhouse lounge in addition to a performing arts studio for arts and dance. There is a club lounge on the top floor in addition to a grand scale outdoor whirlpool with spectacular views of the city. Also, not confirmed, is an on-site fitness centre. Update: Polygon’s Avanti Richmond Condos Opening This Spring!